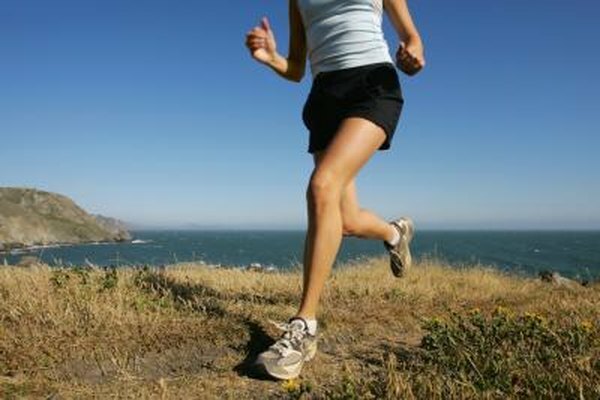 Runners, particularly those who run long distances, are renowned for having low body-fat percentages. This stems from the intense effect of calorie-burning that running has on your body when running multiple miles at a time, several times a week. Runners are motivated to stay light to excel at running; after all, the heavier you are, the more weight you need to carry with each step during a run. Finally, most runner eat a healthy diet. To get your body fat percentage down to that of a serious runner, fuel your body with nutritious food and generous amounts of water, and exercise at a runner's intensity and frequency. Exercise to burn fat. Running burns a large amount of calories compared with other exercises at the same intensity and duration. However, you don't necessarily need to run to burn fat — any cardiovascular exercise performed vigorously will burn the calories necessary to lose fat. Cardio exercises can include biking, jogging, swimming, climbing, and rowing, among others. The amount of fat loss is attributed to the intensity and duration of your exercise. Drink more water. Runners have to stay hydrated while running, and water improves your body's ability to lose weight by keeping your cells hydrated. Your body needs several glasses of water a day to stay healthy. Keep in mind this water can come from any fluid you drink, not just plain water. Exercise for long periods of time at moderate intensity. Lean runners tend to run long distances such as marathons, which are consistent with keeping their body in motion for hours on end while eating very little. This forces their bodies fuel themselves by converting their body fat into energy, depleting the fat. Though you need not run marathons to accomplish this, you will want to focus on long aerobic exercises to burn this level of fat. Eat and treat your body right. Weight loss can be simplified to a game of numbers. If you consume more calories than you burn, your body will store these extra calories as fat. If you burn more calories than you consume, your body will be forced to dip into the reserve energy stored in your fat. By eating healthy foods such as fresh fruits and vegetables, whole grains, lean proteins like fish and poultry, and only moderate amounts of dairy, all in healthy portions, you will be able to keep your caloric intake under control. Eliminate unhealthy foods from your diet. Junk food, fast food, desserts, and soda are all loaded with calories, and not much else in terms of nutrition. While they can be sources of energy, these foods contain large amounts of fat or sugar that quickly converts into fat if not burned immediately. When you are attempting to reduce your body-fat levels, the last thing you need to do is add additional unnecessary fat to your diet. While most moderate to serious runners are lean and low in body fat, runners can still benefit from some body fat to draw upon while running long distances. This body fat can be burned during a long run, sustaining their energy. Before beginning any vigorous exercise program, consult with your doctor. U.S. Centers for Disease Control and Prevention: What Is Healthy Weight Loss?